Natural Hazards: Earth Processes as Hazards, Disasters and Catastrophes , Fourth Edition, is an introductory-level survey intended for university and college courses that are concerned with earth processes that have direct, and often sudden and violent, impacts on human society. The text integrates principles of geology, hydrology, meteorology, climatology, oceanography, soil science, ecology and solar system astronomy. 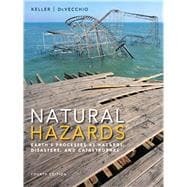 The book is designed for a course in natural hazards for non-science majors, and a primary goal of the text is to assist instructors in guiding students who may have little background in science to understand physical earth processes as natural hazards and their consequences to society. Natural Hazards uses historical to recent examples of hazards and disasters to explore how and why they happen and what we can do to limit their effects. The text's up-to-date coverage of recent disasters brings a fresh perspective to the material. Provide a balanced approach to the study of natural hazards: Focus on the basic earth science of hazards as well as roles of human processes and effects on our planet in a broader, more balanced approach to the study of natural hazards. Strong pedagogical tools reinforce the text's core features: Chapter structure and design organizes the material into three major sections to help students learn, digest, and review learning objectives. Edward Keller is a professor, researcher, writer, and most importantly, mentor and teacher to undergraduate and graduate students. Currently, Dr. Keller's students are working on earthquake hazards, how waves of sediment move through a river system following disturbance, and geologic controld on habitat to endangered southern steelhead trout. He was born and raised in California (Bachelor’s degree in Geology and Mathematics from California State University at Fresno, Master’s degree in Geology from University of California at Davis), it was while pursuing his Ph.D. in Geology from Purdue University in 1973 that Ed wrote the first edition of Environmental Geology, the text that became the foundation of the environmental geology curriculum. Ed joined the faculty of the University of California Santa Barbara in 1976 and has been there since, serving multiple times as the chair of both the Environmental Studies and Hydrologic Science programs. In that time he has been the author on over 100 articles, including seminal works on fluvial processes and tectonic geomorphology. Ed’s academic honors include the Don J. Easterbrook Distinguished Scientist Award, Geological Society of America (2004), Quatercentenary Fellowship from Cambridge University, England (2000), two Outstanding Alumnus Awards from Purdue University (1994, 1996), A Distinguished Alumnus Award from California State University at Fresno (1998), the Outstanding Outreach Award from Southern California Earthquake Center (1999). Ed and his wife Valery, who brings clarity to his writing, love walks on the beach at sunset and when the night herons guard moonlight sand at Arrroyo Burro Beach in Santa Barbara. Duane DeVecchio is currently a researcher and adjunct professor at the University of California, Santa Barbara, where he earned his PhD in geology. Since starting his graduate education, Duane has devoted a significant amount of time to becoming an effective communicator of science to today’s students. He is a passionate teacher and feels strongly that students need to develop the ability to critically evaluate data presented in numerous forms from various sources. He believes this is particularly important in today’s world where the internet offers accessibility to vast amounts of information, yet the validity of this information is often questionable or misleading. Fundamental to teaching this skill is integrating data from his current and past research to illustrate to students the methodology and rigor of scientific investigations. Duane has a broad field-based background in the Earth sciences and likes to tell stories about his many months of living in trailers in the middle of nowhere mapping rocks. For his Masters Degree and post-Masters research he conducted structural and stratigraphic analysis, as well as numerical dating of volcanic and volcaniclastic rocks in southeast Idaho and the central Mojave Desert of California, which record the Miocene depositional and extensional histories of these regions. His PhD research was aimed at resolving fault slip rates and quantifying the earthquake hazard presented by several active fault-related folds growing beneath urbanized southern California. Duane’s current research interests focus on the timing and rates of change of Earth’s surface due to depositional and erosional processes that result from climate change and tectonics. When Duane is not teaching or conducting research, he enjoys whitewater rafting, rock climbing, snowboarding, and camping with his partner, Christy.